Many professors, management members and guests turned out on December 3 for the research and teaching awards ceremony, to salute the accomplishments of professors and researchers. Christiane Robert, Jean Guertin’s widow, attended the ceremony with their daughters Geneviève and Catherine. She said that her family members were proud and deeply moved at this tribute. “Jean would have been delighted and very grateful,” she emphasized. She congratulated the first winner of the Jean Guertin Award on her husband’s behalf, and wished him a long and productive career. James Drew, a Full Professor in the Department of Accounting Studies, joined HEC Montréal over 35 years ago. He has taught accounting and taxation at the BBA and MBA levels, for certificate programs, and for the Graduate Certificate in Public Accountancy. He has also supervised some 40 students on their supervised projects for the Master of Laws program, Taxation option. A renowned expert in taxation, Professor Drew has distinguished himself throughout his career with his teaching skills, his generosity toward students and, above all, his ability to explain a topic that may at first seem rather dry to many people. These qualities are recognized not only by students in their evaluations, but also by his colleagues, who benefit from his expertise. But in addition to his prowess as a teacher, it is also his human qualities, his devotion and sense of humour, that have impressed his students. Professor Drew has always taken time to adapt his courses and teaching methods to his different students. As part of his duties, he has also prepared students for the examinations administered by various professional orders (CA, CGA and CMA). From 1979 to 1990, Professor Drew was in charge of certificates. From 1979 to 1981, he supervised 40 lecturers and handled 17 courses in the diploma in accounting program, which was replaced in 1981 by certificates in accounting. In co-operation with Honorary Professor Pierre Royer, in 1978 Professor Drew published a textbook entitled Impôts et planification, which won its co-authors the Pierre Laurin Award for its first edition. The textbook is now in its 27th edition and has become a standard reference in Quebec taxation. Professor Drew has also written or co-authored cases in taxation and, since 2006, has been working with Pierre Royer on the annual edition of another textbook, Problèmes d’impôt et solutions. 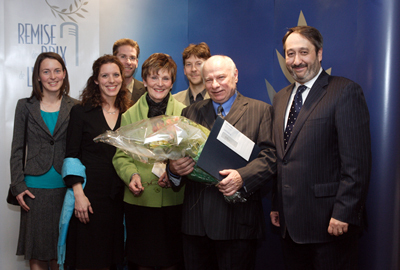 Geneviève and Catherine Guertin (and their respective husbands, in back), Christiane Robert, James Drew, first winner of the Jean Guertin Award, and Michel Patry, Director. The School traditionally also takes this opportunity to pay tribute to professors who retired in the previous year, and to acknowledge their new status as honorary professors. Professors Francine Harel-Giasson and Marie-Claire Malo, both with the Department of Management, and Professor André Pérès, with the Department of Accounting Studies, have joined the ranks of honorary HEC Montréal professors. In addition, at the request of the Canada Research Chairs Program, Michel Patry presented an insignia to the seven holders of Canada Research Chairs at the School, in recognition of their contribution to national research. They are Henri Barki, Jean-François Cordeau, Georges Dionne, Ann Langley, Gilbert Laporte, Guy Paré and Christian Vandenberghe. HEC Montréal has the largest number of Canada Research Chairs in management, more by far than any other institution.